Red Dead Redemption 2 is here. Well, not here here exactly, if you're a PC gamer, as there’s no word yet on when Rockstar’s western epic is coming to our beloved platform. Ayep, while the game-of-the-year frontrunner rides off into the sunset with console gamers, us PC folk have been left behind, hanging off our horses by one foot stuck in the stirrup and our faces in the dirt. Luckily, as non-Red Dead platforms go, the PC is as well stocked with Old West games as a small-town saloon is with moonshine and head lice. It’s not the biggest gaming genre, but a long and storied one, so we’ve found 10 of the best western games for you to saddle up with on PC. The first western game to really take off on PC wasn’t your classic tale of gunslingers and spittoons, but quite possibly the most cruel and unforgiving educational game of all time. So what did it educate you about? That attempting to cross the 19th century mid-West in a caravan was a dangerous business. In the original text-based game, you’d lead a caravan of five people (who you’d typically name after family and friends, for extra immersion) then ride them across the US badlands, managing ever-dwindling food supplies while surviving random events like Apache attacks, breakdowns and, most infamously of all, dysentery. Since its 1971 debut, Oregon Trail has gone through uncounted iterations, many of which you can play online. One of the better modern-day twists on the game is Organ Trail, set in a modern-day zombie apocalypse. And hey, it’s Halloween, so we’re being doubly topical! What is game streaming? Is it the future? The death of gaming as we know it? All those questions dissipate like dust in the desert wind when it means that you can play the original Red Dead Redemption on PC via PlayStation Now. Rockstar’s original great western may never get the proper PC treatment it deserves, so this remains the best way to experience it. It was a refreshing break from the sneering, sardonic world of GTA, telling the tragic tale of John Marston, a former outlaw blackmailed into hunting down his former posse. Redemption had plenty of freakish characters and a dark humour of course, but it also billowed in atmosphere; its soundtrack of coyote whistles and harmonicas accompanying you around the beautiful, barren and deadly territories of the US/Mexico border. Going a little further left-field now, to the strange place where Indians and Indies lurk in the shrubbery, you can find Westerado. This charmingly crusty-looking game is set on a top-down Zelda-like map, where you wander a western town and its surrounds in search of the no-good sunnuvagun who killed your family. Each run of the game is only 2-3 hours long, but it maintains its freshness as your target’s appearance and whereabouts are randomised. The world is filled with little side-quests and interactions with the humble folk of Westerado, and it has some nice roleplaying touches, such letting you choose how you speak with people, or even become an outlaw yourself by shooting up people and robbing banks. It’s a great mini-mix of writing, exploration, and deadly oddball combat that only lets you shoot left and right. All roads lead to Doom, as we like to say here on PC. After 25 years, id Software’s teeth-gritting demonic shooter remains a hotbed of modding creativity thanks to its accessible tools and the timeless mechanical brilliance of the base game. There are two mods that turn Doom into a more rootin’-tootin’ kind of shooter. Fistful of Doom only contains a couple of western-themed levels, but they’re brilliantly detailed, and during your short time with it you’ll be awash in Spaghetti Western music and the blood of demons in cowboy hats. Then there’s High Noon Drifter; a low-tech weapon set that gives you the six-shooters, rifles and lassos of a rampant western gunslinger, complete with sliding mechanics and a hat that you can throw around to use as bait. You can merge this weaponset into Fistful of Doom for the full western experience, use it with other mods, or even add it to the base Doom games themselves. A game perhaps best renowned for its lengthy, semi-legendary demo and the jeering soundbite, “Where aaaare you, Marshall?”, Outlaws was the last great pixel-based FPS of the 90s. Made by storytelling gurus Lucasarts, it was one of the few shooters of its time to actually have a plot: a revenge tale told through elegantly drawn cut-scenes between missions. Its levels can get a little labyrinthine later on, but it still plays brilliantly, combining that timeless quality of fast-paced 90s shooters with forward-thinking mechanics like reloading, sniper scopes, and letting you fan off your entire revolver barrel into a roomful of enemies. Its orchestrated soundtrack (one of the first in videogames) tips its hat to Morricone too. You can pick up Outlaws at GOG.com, where it was revived a few years ago. From a tough time when games weren’t so much concerned with guiding you through to the finish as battering you with a horseshoe, comes Desperados. This real-time tactics game puts you in control of a ragtag gang of specialists including a sniper-medic, explosives expert, and a sultry seductress, whose combined skills you use to tackle gruelling missions set in the Old West. It’s a tough old game, with lovely pre-rendered backgrounds capturing those western climes. Veteran gamers can just think of it as ‘Commandos set in the Old West’. While the sequels were disappointing, lacking the tight mission design and engaging plot of the original, Desperados 3 is currently in development by Mimimi Productions, the studio behind the excellent Shadow Tactics. It’s the perfect developer to help this lost series ride again. A relentless stick-figure parody of all the tropes and conventions we’ve come to associate with westerns over the years, West of Loathing is one of the weirdest role-playing games of recent memory. This monochrome gem lets you pick between playing a Cow Puncher, Snake Oiler or Beanslinger, then sets you on a quest to uncover why the Cows Came Home. It’s wonderfully-written nonsense; a mix of turn-based combat (against plenty of cows, of course), gag-filled chats with the town’s denizens, adventure game-type exploration and puzzle-solving. If games were judged on how much they make you smile, this one’s an all-time great. Outside of the Red Dead series, Call of Juarez is probably the most high-profile western franchise in gaming. Which isn’t saying much, because this slick FPS series has always been perpetually overlooked. If you’re looking for a more story-led experience that still has great gun- and lasso-play, you could try Call of Juarez: Bound in Blood, but Call of Juarez: Gunslinger gets our vote for this list thanks to its high-intensity shooting and gung-ho presentation. It’s more Django Unchained than Unforgiven - self-aware rather than self-serious. With a crisp cel-shaded aesthetic and damage done to enemies indicated by numbers emanating off them with each shot, Gunslinger makes no bones about its identity as a hyperactive, heightened romp through a high-viz Old West. 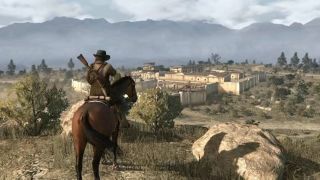 Rockstar’s propaganda machine would like you to think that the predecessor to Red Dead Redemption was Red Dead Revolver, but in terms of open-world design and storytelling, it was Gun that laid the tracks. Made by Neversoft (of Tony Hawk’s fame), Gun was the first true GTA of the West, letting you roam the towns and dusty landscapes of a whopping four American states, with plenty of flexibility for playing the do-gooder hero or the lone-riding bandit. The story is engaging, casting you as an Apache marksman tracking down a murderous gang, but you can equally well just amble around hunting buffalo and chatting to folk, many of whom are based on famed western legends and voiced brilliantly by a Hollywood cast. It may feel a bit creaky these days, but Gun remains the most polished western epic from the days before John Marston shot his way into videogame legend. Somewhere between Wild, Wild West and Cowboys & Aliens, but much more accomplished on an artistic level, sits this adventure from the gone-but-not-forgotten Oddworld Inhabitants studio. In the murky, steampunk-inspired setting of Oddworld, you are the titular Stranger, a mysterious mumbling bounty hunter who travels the weird west hunting down outlaws. Everything in the world feels incredibly crafted - from the bug-firing crossbows to the grotesque and vibrant characters you meet throughout the game. The combat and shooting sections are unremarkable, but the world is richly detailed and filled with character. It’s a western-themed swansong of the Oddworld series, rubbing shoulders with games like Beyond Good and Evil and Prince of Persia: Sands of Time in an era of bold-and-bright adventures. An HD version of Stranger’s Wrath was released on Steam in 2010.